Distribution area: Throughout Thailand in humid regions and flat land. Some have also been found at heights of up to 1700 Meters. 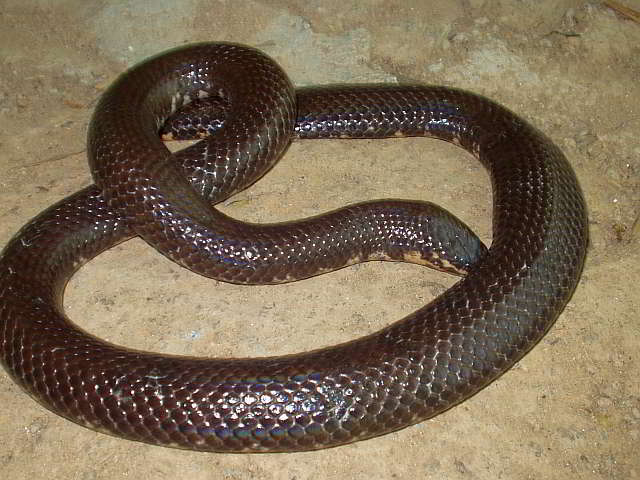 Behaviour: This snake is active at night and sleeps during the day under leaves. It is also frequently found in rice fields. It pretends to be a cobra when aggravated, by putting up its red tail. The head is hidden for protection under the body loops. The Red-tailed Pipe Snake is also called the â€œtwo headed snakeâ€ because of the almost identical appearance at the head and tail. The snakes eat insects and their larva, worms, snakes from Typhlopidae family and are assumed to eat frogs and their spawn. The Red-tailed Pipe Snake gives birth to between 5 and 10 young, approximately 200 mm long. Danger level: Non-venomous; not aggressive snakes.